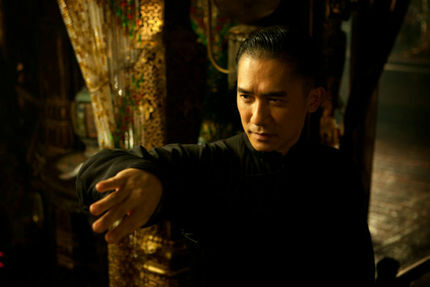 Tony Leung is a grandmaster of the big screen. His collaborations with John Woo, Wong Kar Wai and others have solidified not only his reputation as a master craftsman but one who is able to take that physical craft so attached to the notion of "acting" and translate it into a narrative as well technical force. A Buddhist, he radiates a sense of peace and calm that makes it hard indeed to imagine flashing a gun or fist yet upon speaking with him about his craft it's clear that a sense of spiritual place comes as natural to him as his embodiment of character, dialogue and powerhouse use of force in action scenes. A once in a lifetime opportunity to interview him yielded a memory I shall treasure forever. ScreenAnarchy: As someone who has moved between action and arthouse, was THE GRANDMASTER an intentional attempt to blend approaches? Tony Leung: No, I never plan when it comes to my acting career. What I think is that fate brings people together. Interesting things come up and I think , "Why not." Of course. But in the beginning the film was not a kung fu film. Kar had the idea, we talked about doing, a movie about the life of the man who inspired Bruce Lee. But in the ten years that the idea developed it became the story of the development of martial arts during the life of this man. I myself didn't know a lot about Chinese kung fu at that time. It has been an amazing experience to develop my understanding of it. Even Ip Man. I really only knew about Ip Man because of Bruce Lee. It's interesting to see so many movies come out about Ip Man at the same time the superhero movie comes into full bloom. Do you think those two things are carried on the same waves? Ip Man was a real person of course. People are always craving superheroes. Kung Fu heroes are surely popular for that reason. But Ip Man wasn't just a hero in that sense. He was, in his own way, even more amazing. During my research for the role I would look at these pictures and he looked nothing like a kung fu master. He looked like a scholar. So erudite and graceful. The force is hidden. Very refined. He also lived a very difficult life in Hong Kong. There were times he didn't even have a blanket in the winter. Until he was forty he really had no worries. He was brought up in a wealthy family and made kung fu his hobby, a very serious hobby. But I think that when he had to trade kung fu for money it was even harder than having no blanket. yet you look at those pictures from those years in Hong Kong and you see that he has still managed to hang on to his dignity and his optimism, some small inner measure of happiness. It made the spiritual sense of kung fu even more real to me as I studied it. It's a way of mind. Over the course of four thousand years it has been hugely influenced by Tao and Zen and Iching. At a certain point, after you achieve your physical technique it's almost all about training your mind. Very similar to meditation in Buddhism where you try to remove yourself from emotion and desire and harmonize yourself with nature. Is this how you would typify your spiritual relationship to your art? There was so much here I had no control over which put me deeply in touch with the spiritual side of what we were trying to accomplish and where I was in my own life spiritually. For instance, we didn't have a firm start date so I started practicing and training in my garden. Every so often I would get ahold of Kar and ask if we were ready to start shooting and he would say, Not yet. Soon. Soon." and so, I would keep training. Nine months later I was working with my trainer and he broke my arm right before shooting. I was frustrated and sad. Now I was the one who wasn't ready. But Kar was there to say, "It's okay. We will do what we have to do. What you have to do is rest." The Dr. told me I had to rest for six months. Instead I waited two weeks and tried taking pain killers and wrapping my arms and some light training. Six months later everyone thinks it has healed and we are just starting shooting in China. Yuen Woo-ping has, everybody was there and after a week of rehearsals, the very first day of actual shooting I break my arm, in the same place, worse, in a scene where I was fighting six stuntmen. It was because I refused to stop training. I learned alot about myself that day. Was making THE GRANDMASTER a way of finally getting to make a true kung fu film? I was thrilled. Yes, yes. I grew up reading kung fu novels. And to be able to make this film with the dream team of Yuen Woo-ping and Kar means a lot to me. I grew up with these stories. I think that because the grandmasters almost all moved to Hong Kong, this is why we have a such a rich history of action and martial arts movies and why it's been through so many stages. The talent and energy was there to support it and it's evolution. There was a time when kung fu cinema It seems people are less interested in that these days and I was excited when the project took this turn because I would get to see the way that Kar approached the fighting. It was glorious to make a project where we tried so hard to be faithful to the history and the spirit of kung fu and Chinese heritage. Do you feel like this is a part of the repatriating of kung fu cinema that has been going on? It seems a lot of people want to take it back to it's spiritual roots. Oh yes. There is not much real kung fu left, even in mainland China now. There is plenty of martial arts sports and eye catching display but there are no more schools dedicated to the art of real Chinese combat. You can only learn now from individual masters and they are all dying. I don't even think it's Western influence our nation is just not dependent on it anymore except as a way of commerce. I wish that this could happen again. The ultimate goal of kung fu is the achieving of a peaceful mind and calmness and for me that has been such a great thing. First I want to take a very long holiday. But when I was in Korea with Ziyi Zhang who plays my wife in the film I saw some press pictures and approached Kar about doing an action comedy together. So I think we are trying to develop that for next year. I know that John Woo is shooting an epic 1950's story in Beijing right now. The Grandmaster expands wide in theaters across the U.S. today (Friday, August 30). Check local listings for locations and showtimes. League of Gentlemen's Apocalypse London Premiere Ticket Giveaway! Yakuza Papers Boxset. Delay Over Production Issues.